"Divergent," the latest young adult bestseller to hit the big screen, is getting ready to launch itself into theaters this Friday -- bringing a cast of young up-and-comers and A-listers along for the ride, along with a legion of loyal readers. The film, based on the first book in a trilogy by Veronica Roth, is poised to be a potential blockbuster. Hollywood has high expectations for the film, and there's enormous pressure for it to succeed after a string of YA adaptations like "Beautiful Creatures" and "The Mortal Instruments" failed to have the same sort of box-office power as "The Hunger Games." "Divergent" takes place in a dystopian future where everyone is sorted into factions based on their main attributes -- Abnegation (selflessness), Erudite (intelligence), Dauntless (bravery), Candor (honesty) or Amity (peacefulness). The story's heroine, Beatrice "Tris" Prior (Shailene Woodley, of "The Descendants" and "The Spectacular Now"), learns she's "divergent," meaning she fits into more than one faction and is therefore a threat to her society's social order. The film, with its post-apocalyptic setting and young female heroine, has drawn many a comparison to "The Hunger Games." That's fine by Theo James, who plays Four, Tris' instructor and love interest when she joins Dauntless -- but, he tells CBS News, there are major differences between the two. "Inevitably there are going to be parallels, and that's not a bad thing," he said in a recent interview. "But I think the themes are quite different. This is about choice, how your choices affect your future, identity, questions of who you are...the crux of it really is it's a strong enough story to have its own journey." This marks James' first major film role, and the 29-year-old actor says he was drawn to the character because the brooding, complicated Four isn't like the typical male leads from other young adult tales. "When you're decided to commit to something, which is potentially three movies and the commitments that come with it, you have to be sure of the character. And I was sure of it from the beginning," said James. "[Four's] abiding by a very strict moral conscience and good sense of empathy but he's also this very broken, dark, mistrusting person." James and Woodley's on-screen chemistry is palpable, and the actor had high praise for his co-star. "She's great. She's very open and emotionally intuitive," he said. "She maintains her femininity but is also very strong." Co-stars Ashley Judd and Tony Goldwyn ("Scandal"), who play Tris' parents, Natalie and Andrew Prior, were also impressed by the 22-year-old actress. "I think she's brilliant," said Judd. "Very true to herself and talk about having the courage to be who you are. She really is." "And a really like, old soul in a very young body," Goldwyn added. "She's an extraordinary woman." The two also weighed in on the film's themes and what they hope audiences will take away from it. "There's the idea, for the young person and even as an adult, of having the courage to confront one's fears in order to face who you are, and that changing identity that happens as we continue to individuate throughout our lives," Goldwyn said, "because there is that push-pull between this instinct, this burning need to individuate ourselves and also this equally strong -- if not stronger -- need to belong. And those things are always in seeming conflict, and it always requires courage to look at that honestly." With a 2015 release date already set for the sequel, "Insurgent," it's clear Lionsgate and Summit Entertainment are banking on a "Divergent" hit. In the meantime, as the film is poised for release, the actors say they're excited to be part of a franchise with such a big fan base -- and even have a sense of humor about it. When asked what faction he'd choose if he had to, James joked, "Slythern" -- before adding, "Dauntless. They're the most adventurous." 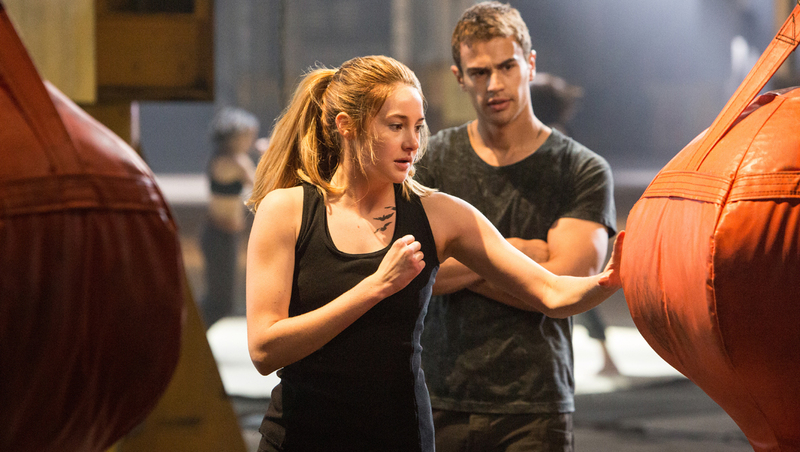 Tell us: Are you planning to see "Divergent"?